Anybody can gain royal status by making the right moves: Princess Fergie simply married into it, while others like Rey Mysterio earned it via a Rumble's-worth of endurance, Tiger Feint Kicks, and Frog Splashes. Soooo many Frog Splashes. 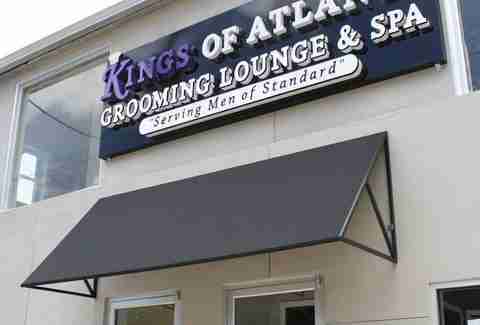 Gain both sovereignty and cleanliness at Kings of Atlanta Grooming Lounge & Spa. 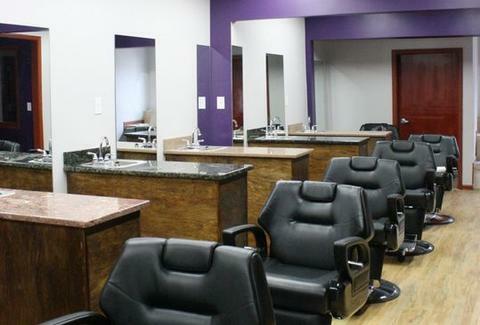 Opening next Tuesday but taking reservations now, Kings is a bi-level salon with hair-trimming downstairs among appropriately purple walls, hardwood floors, six flatscreens, and a black marble-topped bar w/ antique stools, plus an upstairs spa for man-treatments & massages, started by a veteran barber who wanted to knock down barriers that keep men from being well-groomed, who says "Ain't nothing cute about a grown man" -- Emmanuel Lewis, you break alllll the rules. Entertain yourself pre-/mid-cut with sports/political/financial channels and overhead tunes while getting preening services like "The Crown": their signature haircut which comes with either a calming or energizing aromatherapy shampoo, a face wash, and a shave using a hot towel and a straight edge, which is fine, as long as some teetotaler isn't controlling those overhead tunes. Next, head upstairs for 30-minute sessions like "The Cloak" (a deep tissue massage), the "Regal" face treatment that handles ingrown hairs and razor burns, "The Quill" man-icure (w/ hand & forearm massage), and "The Throne" pedicure, which is described as "the foundation that keeps Kings standing tall", aka what Dexter calls his inheritance. For a complete overhaul get the "Renaissance" package, which includes all services, plus a 30-min image consultation from Kings' resident wardrobe expert. Soon you'll be able to enjoy alcoholic bevs at the bar while you wait, or hit the shoe shine platform, which'll have you looking like a Million Dollar Man, or failing that, at least Iron Chic.